For ideal handling of all the situations and affairs in a home, there are suggested and recommended types of furniture every home lover wishes to own! 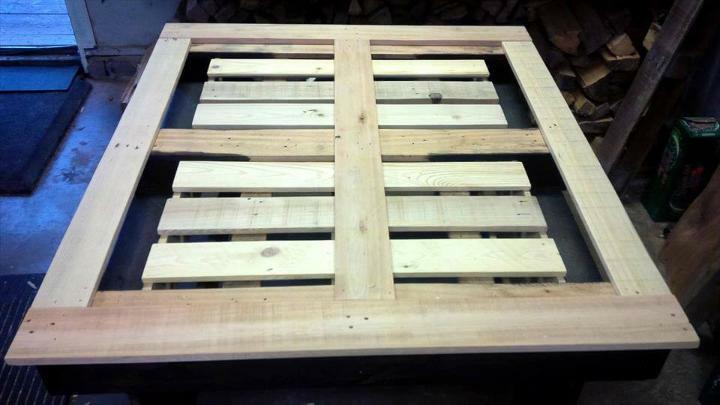 DIY has made it all budget-friendly and easier the gaining of custom furniture, the home lovers can simply mess with pallets to craft whatever they want having in their list of required furniture! 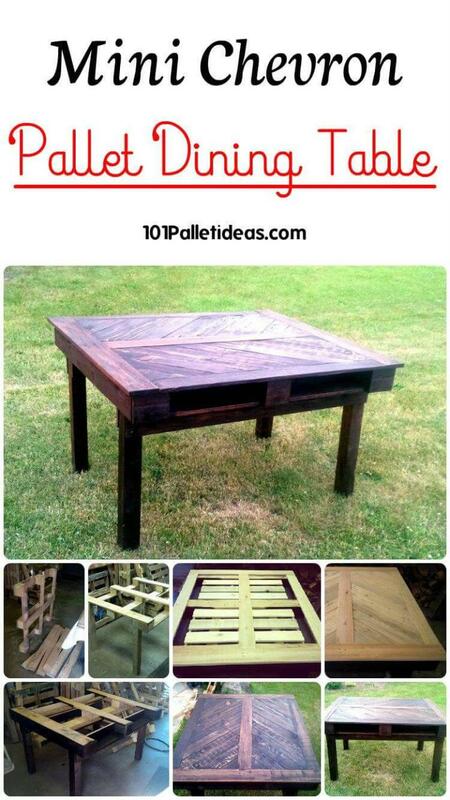 How easy may be the custom pallet furniture constructions, we are going to tell you through this DIY pallet dining table tutorial, having all ideal and standard dimensions and comes with a chevron filled top that simply makes it out of ordinary! 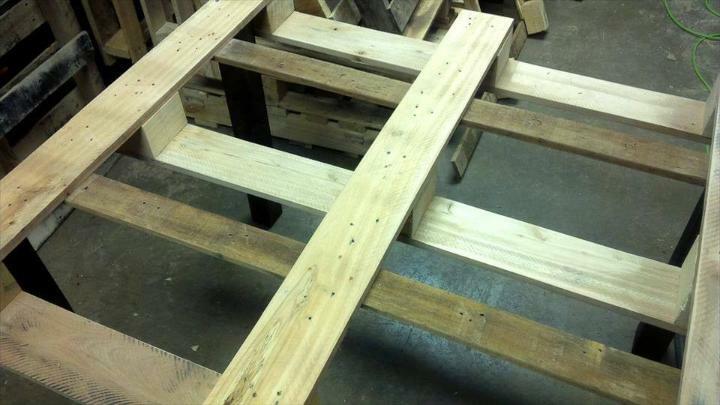 A pallet skid with removed deck boards have been decided here to build up the top while filling of top has been done later! 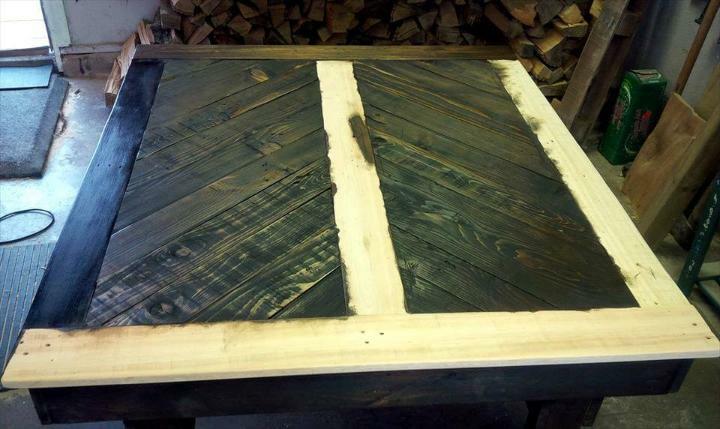 Custom stain coats have been applied for a custom appearance which also extend the pallet table lifetime as they will avoid the early signs of weathering and will not let the damaged from water effects! 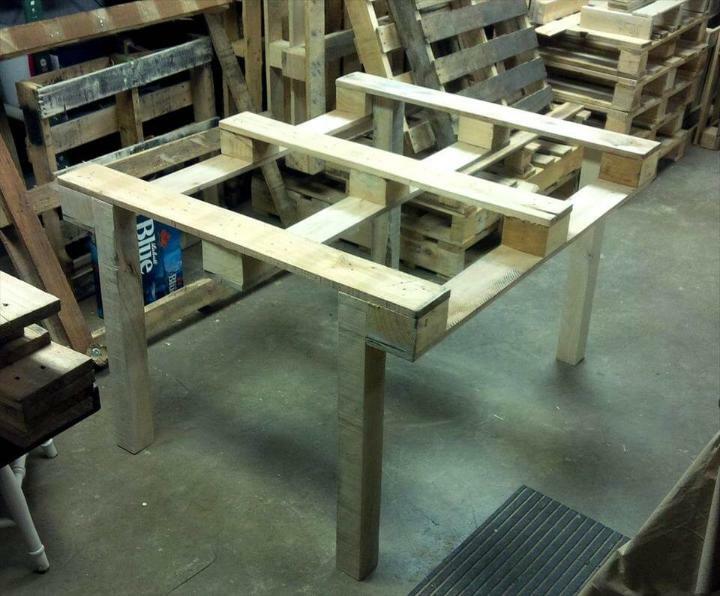 Follow the tutorial to learn more about this feasible dining table construction! A dining table is main in items of home furniture and it is also what you need to get first for guest entertainment affairs and also for occasional night dinners when you are with a big group of friends! 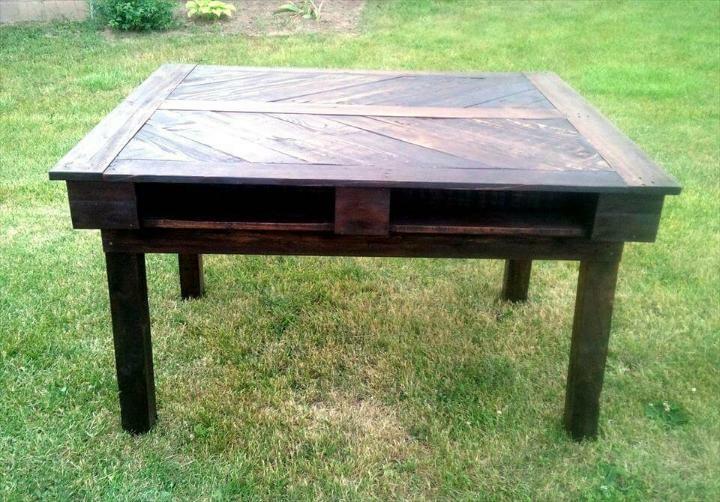 Here is an all easy way to reach your favorite dining table models for free, checkout the details here!!! 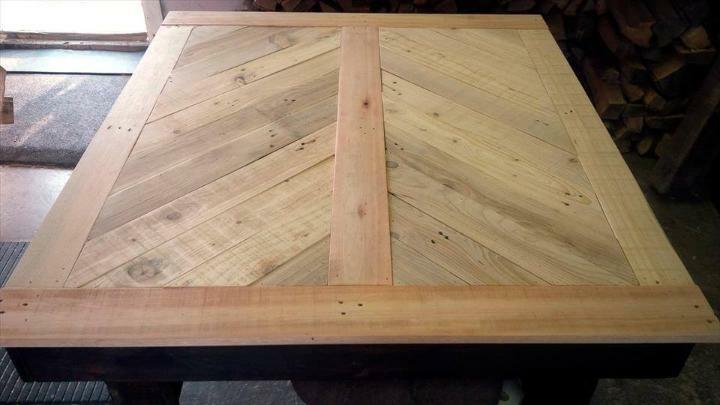 For building this exclusive chevron dining table design here, it has been decided first to gain a pallet skid first with no deck boards, here you can see how the deck boards have been removed from a pallet board! 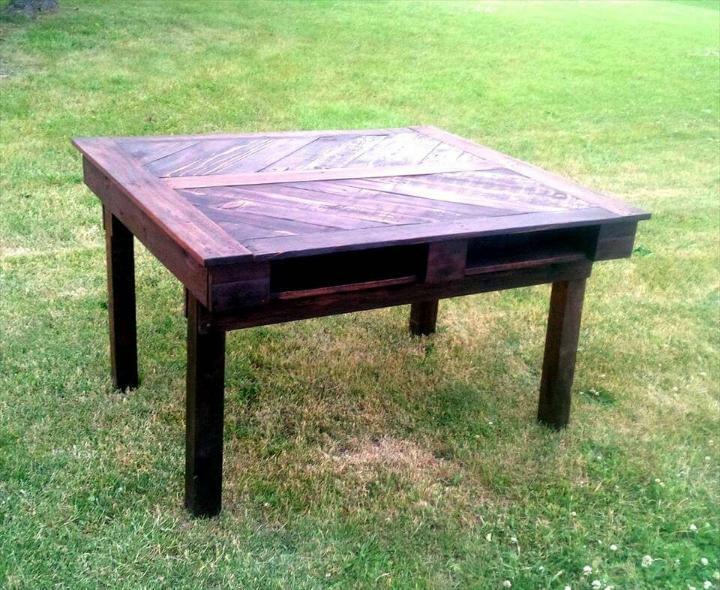 The modified or pallet board with no deck boards, have been set as a primary surface for dining table top installation and has been installed on sturdy wooden legs to do so! 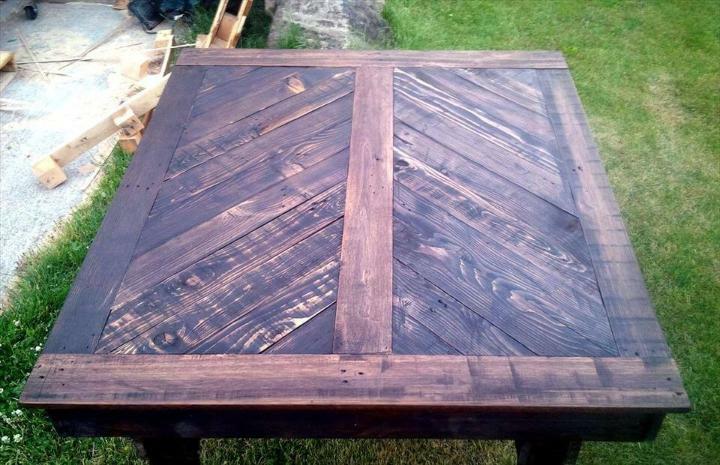 A complete sanding has been done of sides and edges just to make the all splinters vanished from the wooden surfaces and to gain only a evident clean look of the wood! The entire primary frame or base of the table has been stained or painted in black here as per demand of matching hue of dining table but you will be your own boss and can select any color theme for the dining table! Here a chevron top has been intended to get so a frame has all been prepared using extra wood for an all convenient filling of pallet slats in chevron way later! Now just start filling the top in chevron way and you can add first the mini pallet triangles first to the top corners as shown! 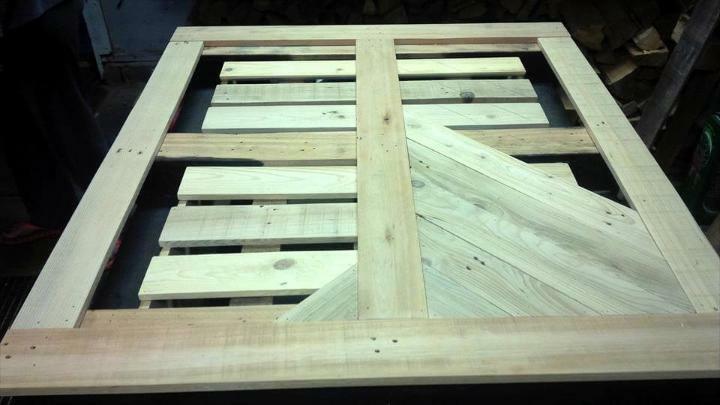 Now you can keep on adding the pallet lengths with all sharp edges to complete the top in chevron pattern! Here is the final filled and robust chevron top of the dining table which can be painted, stained or varnished just to match the decors of environment where it has to be used! Here you can go with your own consent, can select the black stain, light or dark walnut, golden oak, red mahogany and other weathered grey one shades of stain! 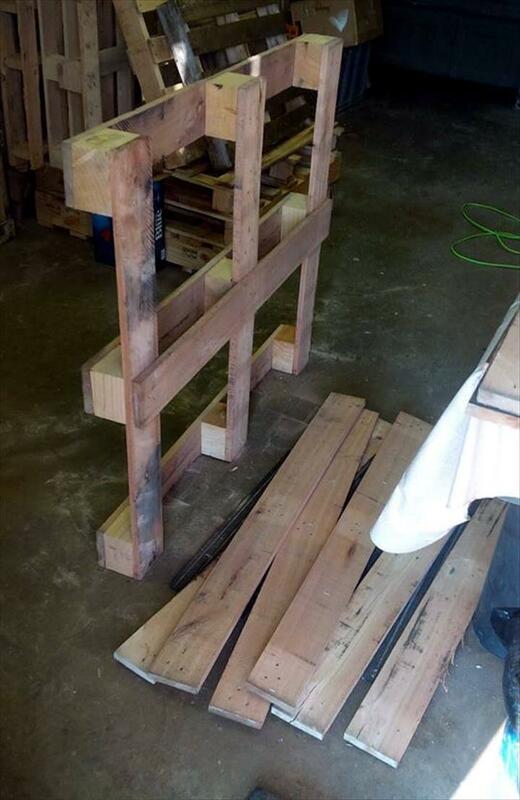 Selection of stain will also depend on the nature of pallet wood! Here this antique avatar has been gained by using darker stain shades and it would be all perfect to add to a mid century or vintage dining rooms! 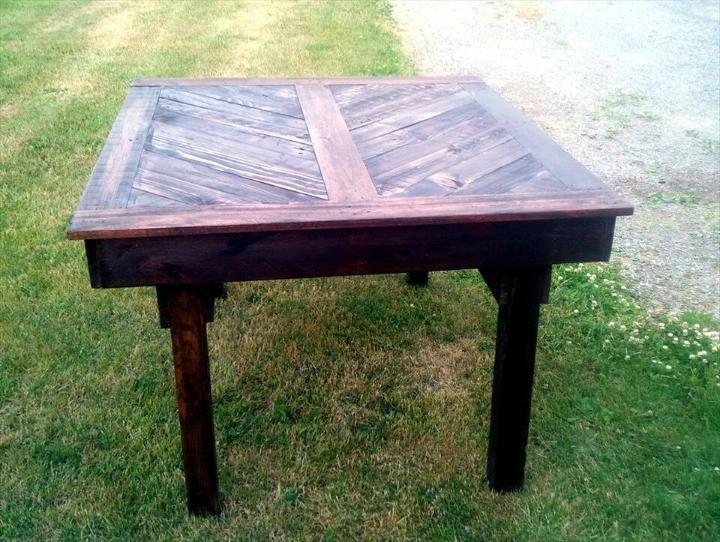 Also grab this dining table for patio or garden dinners and also to enjoy the backyard picnic or snack parties! Extra cross supports will not let the dining table die early! 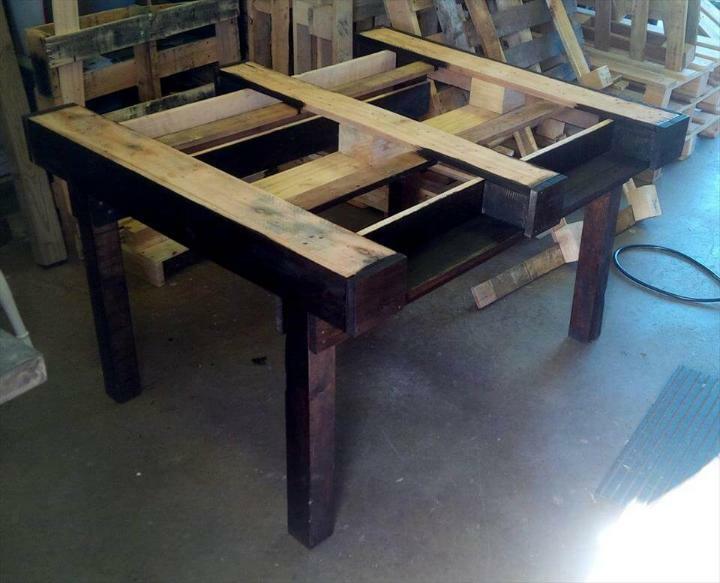 This custom dining table design also comes with storage openings which can hold well all the necessary mini tools and convenience, really a great bonus here!